Birds. They may be the world’s most watchable, and listenable, wildlife. Even non-birders will turn their heads at the sight of a bald eagle perched over a river or strain to hear an owl’s hoot. And who doesn’t acknowledge the robin as a harbinger of spring? Nationwide, 45 million people, or 14.5 percent of all Americans, call themselves bird watchers, according to the U.S. Fish and Wildlife Service. What the rest of the population fails to recognize is that they are birders, too, seeing or hearing birds nearly every day. Birds are a ubiquitous connection to the natural world. Connecting to birds takes only a moment’s wonder. What are those birds eating the berries in the backyard? What is making that screeching sound? What kind of duck is that? As soon as someone is tempted to find the answer, a bird watcher is born. Fortunately, bird watching as a pastime has never been easier. Locally, public lands, including Pitkin County open spaces, offer an array of habitats that facilitate bird viewing. Coming this year is a new addition at Pitkin County’s North Star Nature Preserve – a bird blind from which to spy on the avian community. In addition, organized programs give everyone from beginning birders to seasoned observers a chance to see a wide variety of native and migratory birds. Birders can also watch winged wildlife from the windows of their own home, or take advantage of cameras like the Emma Osprey Cam, which provides live footage of bird activity from a vantage point that would be otherwise inaccessible. The camera, accessed at www.pitkincounty.com/osprey, allows online viewers to watch a breeding pair of osprey as they raise their young at a nest located on open space in the midvalley. Rebecca Weiss, who guides birding programs for the Aspen Center for Environmental Studies, sees an expanding demand for bird-watching outings as participation continues to grow. 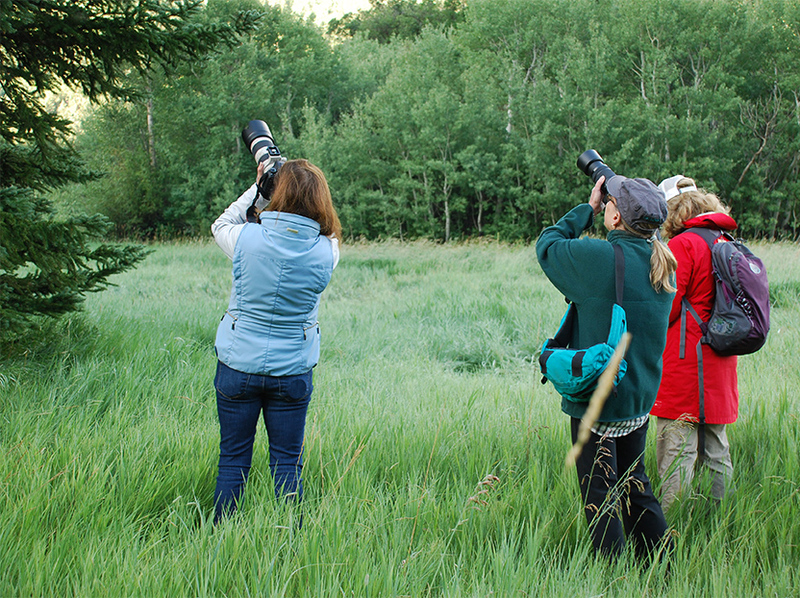 ACES will offer a weekly birding program every Tuesday from June through September, alternating between ACES’ Hallam Lake and Rock Bottom Ranch locations. Previously, Rock Bottom Ranch near Basalt offered birding just once a month in the summer season, but interest in the midvalley has mushroomed. In addition, ACES’ birding field trips this year will include one in the Crystal Valley for the first time. Weiss also leads birding programs at Pitkin County’s North Star Nature Preserve, pointing out species she recognizes by sight or, most impressively, by their call. Birding was once considered nerdy and intellectual. It probably still is, jokes Weiss. However, she contends, nerdy and intellectual is “in” and so is escaping into nature, away from cell phones and other distractions. Listening to a cacophony of chirps and trills on a cool morning is a meditative and welcome respite from life’s demands. A birding hobbyist can also contribute to a vast and important body of research. Legions of bird watchers have joined the growing, worldwide group of “citizen scientists” who track bird sightings and report them. Mobile apps provide help with bird identification at one’s fingertips, from plumage to bird songs. The website eBird, managed by the Cornell Lab of Ornithology, collects data from birdwatchers around the globe, including participants in the Roaring Fork Valley. The observations of individual birders provide a significant source of data for scientists examining birds and the environment on a broad scale. Changes in the distribution or migration patterns of birds are documented through the compilation of sightings by innumerable backyard birders. Weiss offers as an example the wood thrush, a North American bird distributed across the eastern United States. Through the work of citizens recording their observations, scientists now know this species, which breeds across a broad swath of the U.S., migrates to a small area of the Yucatan Peninsula for the winter months. That means preservation of the habitat in the Yucatan is critical to the survival of the species – knowledge scientists can pass on to policymakers and conservation groups, Weiss explains. Birds take flight across political boundaries and hemispheres. Watching them – and watching out for them – brings people together. Locally, Weiss has noticed an influx of species that did not used to frequent the Aspen area. The increased presence of black-chinned hummingbirds, the pygmy nuthatch and black phoebe may signal changes in habitat connected to climate or other variables. Weiss’ observations, combined with those of thousands of other bird watchers, provide the clues that allow for scientific analysis. Go to https://ebird.org/region/US-CO-097?yr=all to view recent data from local birdwatchers and learn how to contribute your own observations. See the event schedule below for a program on Building Your eBird Skills. Find more information on birding from ACES at https://www.aspennature.org/birding-resources and use the site to register for upcoming birding programs (see the schedule below). Roaring Fork Audubon – at http://www.roaringforkaudubon.org/ – is also a source of birding information. The local chapter counts 650 people on its email list.